The historic building where girls learned to sew, boys learned to fix furniture, and immigrants learned English, and which for the past thirty years protected your community’s irreplaceable historic documents and photographs is now an empty shell. Over the course of several months, volunteers carefully transported 350 years of Huntington history from the Trade School building on Main Street at the east end of Huntington village in preparation for a major project to restore the building to its original glory and to expand the building to provide more space to protect the existing collection of historic materials and to welcome new additions to that collection. This is the most important project undertaken by the Huntington Historical Society in over a generation. The Historical Society needs your help to make it a success. To understand the project, let’s go back to the beginning—the very beginning. 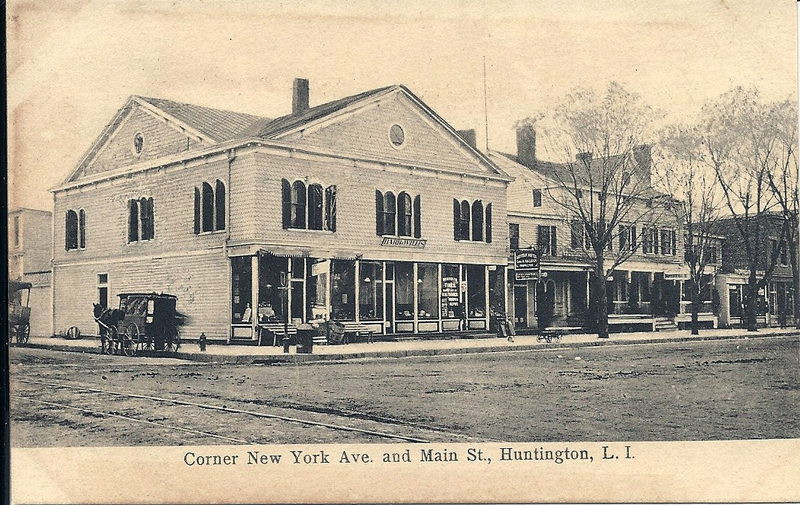 In 1903, Huntington celebrated the 250th anniversary of its founding. Thousands attended the three-day celebration over the Fourth of July weekend. 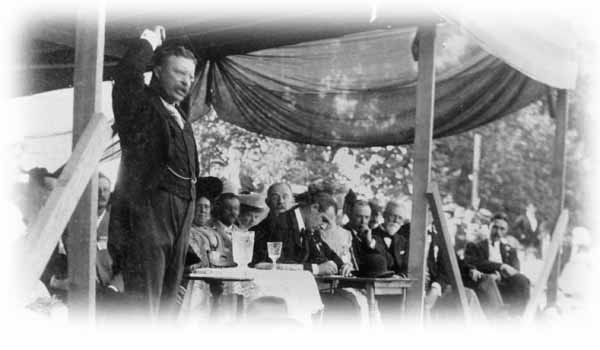 The highlight of the celebration was a speech given by President Theodore Roosevelt to a large crowd gathered in an empty field near the intersection of what is now New York Avenue and Gerard Street. President Theodore Roosevelt at Huntington’s 250th Anniversary celebration. A committee of local women gathered historic artifacts from attics, basements and barns around town for a display on colonial life in Huntington. That collection was kept together by the committee, which eventually became the Huntington Historical Society. Fast forward some eighty years. The Historical Society by the 1980s operated two house museums—the circa 1750 Conklin House on High Street and New York Avenue, which was given to the Society in 1911, and the 1795 Kissam House on Park Avenue, which it had purchased in 1967. The small collection of colonial artifacts gathered in 1903 grew tremendously over the decades to include letters, diaries, business records, local newspapers, maps, deeds, family histories, and photographs—thousands and thousands of photographs of the way we were. More space was needed to properly preserve this growing collection. In 1979, Town government had consolidated its offices in the old high school building across from Heckscher Park, making several buildings at the east end of the village available. The Tudor Revival trapezoidal shaped Trade School building caught the eye of the Historical Society. The Trade School building was constructed over the course of the summer of 1905 to house the Huntington Sewing and Trade School. The school had started in the basement of St. John’s Church on Park Avenue in 1881. At first the school taught sewing to the girls of the church. Some of the items the girls created were sent to missions in the West and later during World War I to France. At the turn of the twentieth century, Miss Paulding’s Sewing School was providing instruction to up to 150 students a week in rented quarters in the village. In 1904, the school was formally chartered as the Huntington Sewing and Trade School. 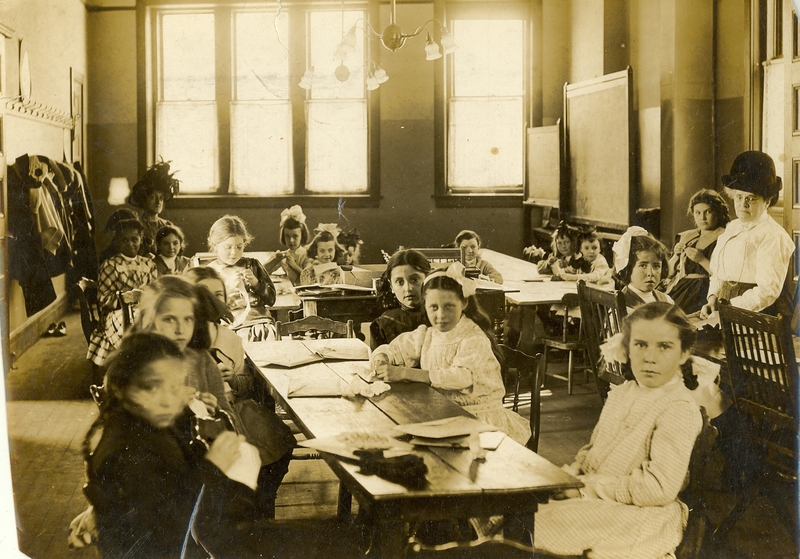 In 1905, the school began to look for a permanent location. Local philanthropist Cornelia Prime—who would later donate the clock tower in Huntington’s first Town Hall and the land for Huntington Hospital, among many other gifts to the community—agreed to erect a suitable building for the school. Dr. Oliver L. Jones donated land on the north side of Main Street across from the Old Burying Ground. Cady, Berg & See, the firm that designed the Museum of Natural History in New York, the Metropolitan Opera House as well as several academic buildings at New England colleges, was selected as the architect for the building. Twelve years earlier, the firm had also designed the Soldiers & Sailors Memorial Building, Huntington’s first library building. 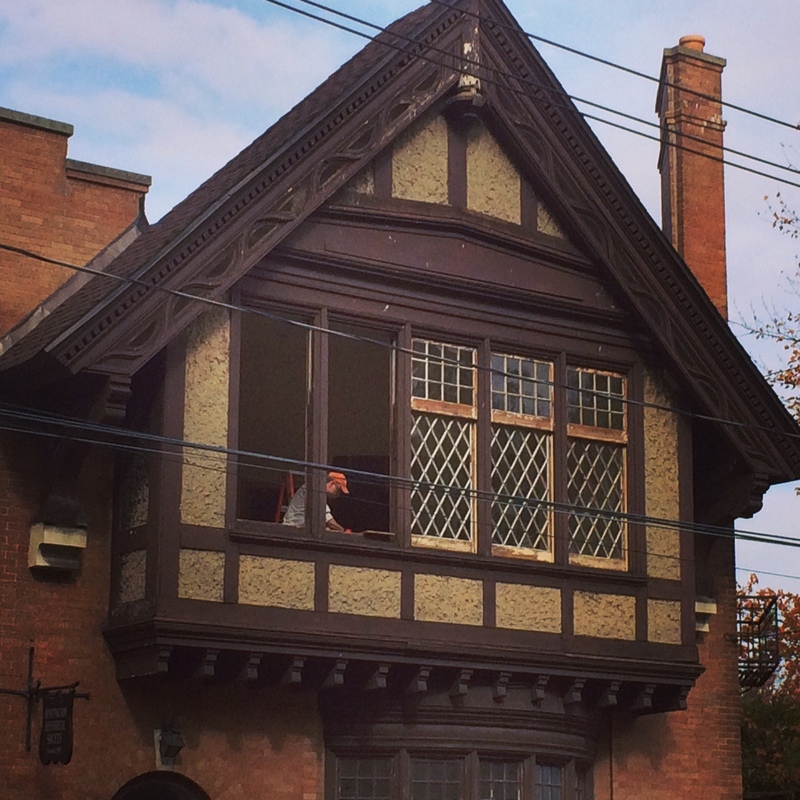 The new school building copied the library’s Tudor Revival style. The building also conformed to the site’s trapezoidal shape enabling a traveler from the east to see three sides of the building at the same time. 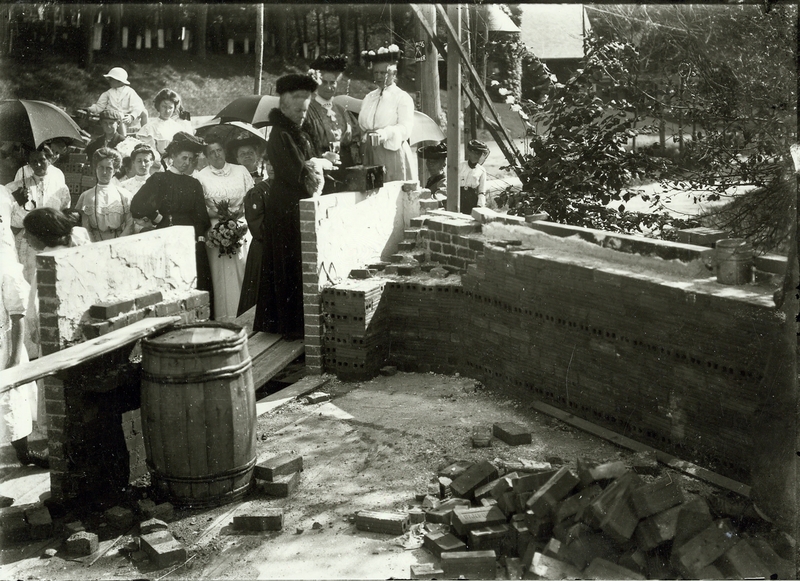 The cornerstone was laid on August 10, 1905. The first classes in the new building were held just four months later on December 2, 1905. The building saw a variety of uses over the years. During World War I, the local chapter of the Red Cross used the building for its home front activities. The curriculum expanded to teach vocational skills to immigrants. Courses were also offered to help immigrants learn English and civics to meet the requirements for naturalization. The main floor of the Trade School building. Miss Lefferts taught dance classes, a Talmud Torah School rented space, the Red Cross taught “young mothers the feeding and care of children,” the Huntington Choral Society practiced here, to name a few of the building’s many uses. In 1937, the Huntington School District took ownership of the building and used it for shop classes. Students from the High School (which is now Town Hall) walked over to the Trade School. Wood shop was taught on the first floor, electric and metal work on the second floor. In 1965, the Town purchased the building to help alleviate crowding at the Old Town Hall building. Town government used the building for the Comptroller’s office and later the Town Supervisor and Town Attorney had offices there. In the 1970s, the Town realized that operating out of multiple buildings in widely scattered locations was not efficient. As Town government grew, the school district found it no longer needed the large school building across from Heckscher Park. The High School had been moved to a new building on Oakwood Road in 1958 and the building was being used as a Junior High School. Meanwhile, the Huntington Historical Society’s collections grew tremendously over the course of the twentieth century. The fireproof vault built at the Conklin House in the 1920s was no longer big enough to hold the priceless collection. With the aid of private donations and a National Endowment for Humanities grant, the Society paid the Town $50,000 for the Trade School building. Another $75,000 was spent to renovate the building: new heating systems, new roof, plaster repair, painting, new handicap accessible restroom, etc. At first the archives collection and research room comfortably occupied the lower level. Within ten years, exhibit space on the main level gave way to the growing archives collection. Within another ten years, it was obvious that a more long-term solution was needed. Plans were made to build an addition in the vacant lot the Historical Society owned on the west side of the building. 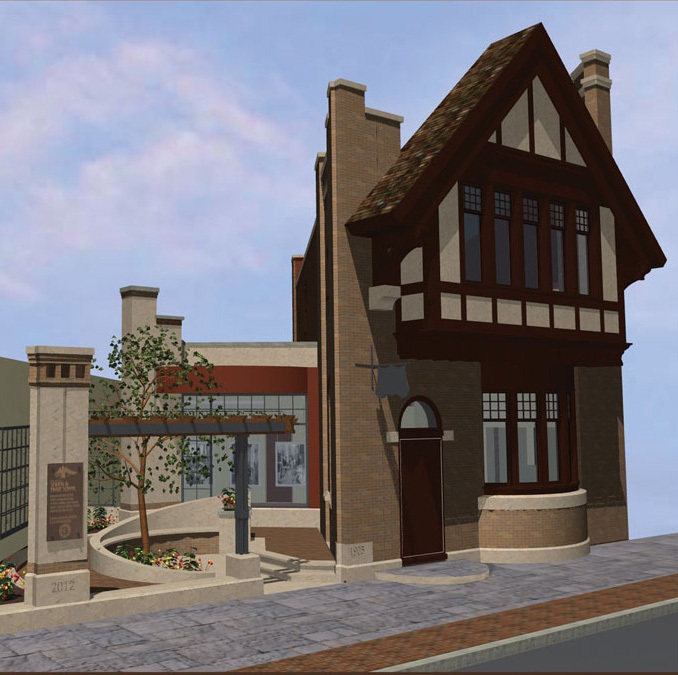 Architect’s rendering of the entrance plaza and the new addition, which is set back to preserve the architecture of the 1905 building. The project finally commenced in the summer of 2014. The project will restore the 1905 building. The windows will be restored. The old electric wiring, which still relied on early fuses, will be replaced. The HVAC systems will be replaced. Plaster walls will be repaired and painted. New carpets will be installed. Restoring the magnificient diamond pane windows of the Trade School. But most important, the capacity of the building to accommodate the Historical Society’s ever growing collection of historic material will be greatly increased. High density shelving on the lower levels of the old building and the new addition alone will triple the storage capacity of the building. Other space in the new addition will provide even more storage. The project is important to the future preservation of Huntington’s history—not only the materials already being preserved, but also future donations. Without the additional space this project will provide, the history of the more recent past could well be lost to future generations. NOTE: The Huntington Historical Society is still seeking donations to ensure the completion of this project. At the time of this posting, the Historical Society has raised through private donations almost $800,000. A grant from the New York State Office of Parks, Recreation and Historic Preservation adds another $400,000 to the budget. The total project budget is $1.5 million, meaning an additional $300,000 needs to be raised. If you love Huntington’s history, which you must if you read this blog, it is imperative that you support this project. It is no surprise that as Huntington Town Historian, I support the project. Many people assume my family has lived here for generations. Some even think I’m a WASP. In fact, I’m an Irish Catholic who moved to Huntington as a kid. My wife moved here after we were married. But it doesn’t take long to appreciate how special Huntington is and how important its history is to its unique sense of place. That is why the largest charitable donation we have ever made is for this project. We urge you to show your support with a donation of any size. Large donations are important, but smaller ones also make a difference by showing foundations and other funding agencies that the project has broad public support. If everyone who follows this blog gave $100, the project would be $10,000 closer to its goal. Donations can be made in installments. For example, a pledge of $1,000, which would be noted on the donor plaque, could be paid by making monthly donations of $35. Donors have until June 30, 2017 to complete their pledge. Please make a donation today at www.savehuntingtonhistory.org or by mailing a check to The Huntington Historical Society, 2 High Street, Huntington, NY 11743. If you have any questions about the project, call Linda Walch, executive director of the Historical Society at (631) 427-7045, ext. 405. Future generations of Huntingtonians will thank you. 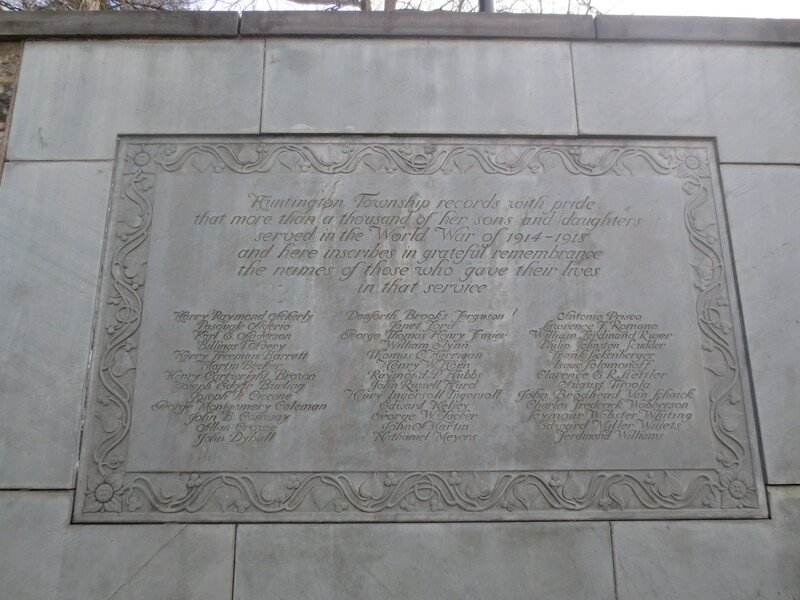 The first war memorial in Huntington, a list of 40 men who had died during the Civil War, contains familiar old Huntington names such as Sammis, Conklin, and Brush. The second war memorial in Huntington, created in 1923 to commemorate the 39 Huntingtonians who had died during World War I, reflects Huntington’s changing ethnic make up. In addition to the old Huntington names, the list includes names such as Algerio, Romano, Solomoff, Sickenberger, and Tivola. More interesting is that the list includes a woman, Janet Ford. Huntington’s World War I Memorial on Main Street. 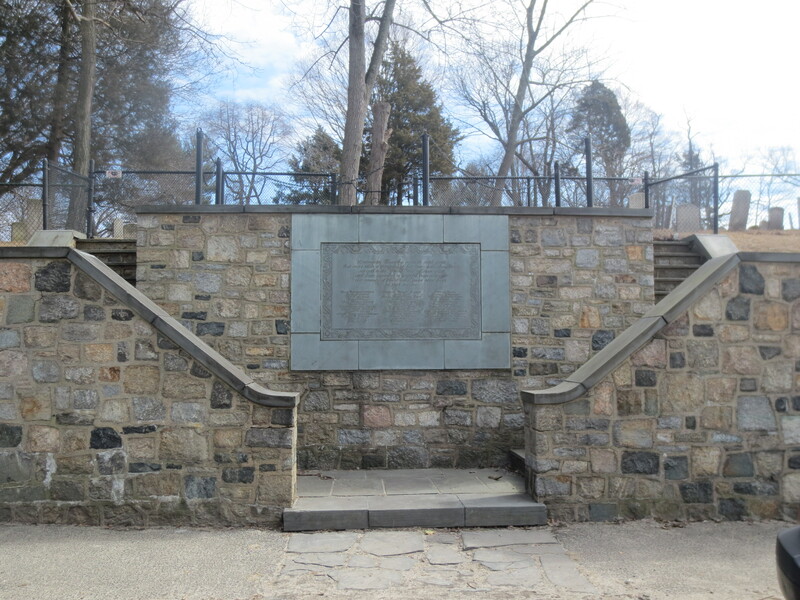 The Memorial also serves as an entrance to the Old Burying Ground where many of Huntington’s Revolutionary War veterans are buried. Janet Ford was a graduate of the Huntington High School class of 1909. She and her twin sister Eleanor graduated from Smith College four years later. Not much is known about Janet Ford. She and her sister were involved with the Huntington Red Cross chapter. She was prominent enough to be included in a couple of New York Times columns about the social doings in Huntington. Her father was employed as an expert accountant with Olney & Company in New York City. He seems to have tried his hand with farming for a while on West Neck Road in the 1890s The family eventually purchased the house at the southwest corner of Lawrence Hill Road and Carley Avenue. They continued to spend time in Brooklyn as well. When the United States entered World War I, there was a need for clerical workers. The 1916 law authorizing the creation of Naval Reserve Force did not specify that yeomen needed to be men. Eventually, 11,275 women joined the Naval Reserve Force as yeomen. Eighteen women from Huntington served in the military; one was Janet Ford who served as a Navy Reserve yeoman in Manhattan. She died in January 1919—two months after the Armistice was signed but while she was still in the service. At first the cause of death was reported as pneumonia—the same disease that had taken her father and mother 10 days apart in November and December 1918. A later report attributed all three deaths to influenza. The 1918 flu pandemic claimed tens of millions of lives worldwide (estimates range from 3% to 6% of the worldwide population died from the flu). In the United States, some 500,000 to 675,000 people died. In fact, ten times more people died in the United States from the flu than from the war. Half of the American servicemen who died during World War I died from the flu. Even though she died far from the battlefield and after the Armistice, Janet Ford has always been counted among those Huntingtonians who gave their lives in the War to End All Wars. Janet Ford is the second name in the middle column. The title of this post may be subject to dispute. After all, 18 Huntington women served in World War I. Janet Ford is the only one to die during her service. I hope I can be allowed a little latitude with the claim that she was the first woman veteran. As the Great Depression was just beginning, Florence Baker looked around her town and was disgusted by what she saw: littered roadsides, ugly billboards, neglected properties. Perhaps nowhere was the neglect worse than in Huntington’s ancient Green on Park Avenue—worse because it was one place that civic pride would dictate should be well kept. After all, the few acres of land had been set aside three centuries ago and held in trust for every Huntington resident. But a place that belonged to everyone seemed to have no one willing to take responsibility for maintaining it. Florence Baker and some wealthy and influential friends made sure that changed. Their efforts went far beyond cleaning up a small park at a busy intersection. They expanded their scope to include the area from the Green to the harbor. They expanded their vision from cleaning up litter and clearing weeds to preserving open space and historic structures. Some 75 years later their vision has been adopted—often unknowingly—by other residents as well as town officials. Baker served as chairwoman of Huntington’s Roadside Committee, an offshoot of the Long Island Chamber of Commerce Roadside Committee. Formed at the outset of the Great Depression, these committees were dedicated to beautification projects that also served to provide jobs for the unemployed. In 1931, the Huntington Roadside Committee worked with the Town Highway Department to remove discarded automobiles from the town’s roadsides, clear brush along the town’s streets, and remove illegal signs. Baker soon turned her attention to the Town Common, better known today as the Village Green. In 1924, the Green was described as “an unhealthy looking, swampy, mosquito breeding marsh [containing] rotten, broken down trees, masses of rubbish and weeds, and enthroned upon all the hulk of a deceased Ford automobile.” She was joined by residents such as Marshall Field of Lloyd’s Neck, Raymond Ingersoll of Duck Island, Henry H. Saylor, the Reverend Dr. Edward Humeston of Old First Church, Russell Sammis and most importantly Henry W. Cannon. Cannon was the president of Chase Manhattan Bank and owned a large tract of land on the east side of Park Avenue across from Sabbath Day Path. They called themselves the Committee on the Preservation of Old Huntington. The first order of business was to convince the Town Board to clean up the Green, not only for the sake of civic pride, but also as a way to provide jobs at the depths of the Great Depression. The Town Common was set aside soon after the Town was first settled in 1653. Over the years adjoining landowners encroached upon the Green. The situation became intolerable by the 1730s. Neighbors demanded that Thomas Wickes, Jr. relinquish parts of the Green that he had occupied. He did so by a 1739 deed that was worded in such a way as to be misinterpreted to the effect that it appears he created the Green and gave it as a gift to his neighbors. In fact, he was being paid off to ensure he returned what was not rightfully his in the first place. This original Green is a rectangular piece of land running along the west side of Park Avenue from the entrance to the Flanagan Community Center (formerly the Village Green School) to a point 329 feet north of Main Street. The triangle of land bounded by Main Street, Park Avenue and Sabbath Day Path was at the time mostly privately owned. The Town Common only included a small triangle at the southeast corner of that plot. The remaining six acres had been the Mathew Hoban Farm. Hoban was an Irish immigrant who acquired the land in 1849 from the estate of Thomas C. Hendrickson. The conveyance was subject to a six foot wide “footway” from “the highway that leads from Huntington Harbour (sic) past the Episcopal Church to Henry Lewis” (i.e. Park Avenue) and ends at the southeast corner of the Presbyterian Meeting House. Such was the beginning of Sabbath Day Path. At the beginning of the twentieth century the Hoban Farm was acquired by Richard W. Kenney, who the same day transferred ownership to his friend Edward P. Cringle. Kenney had been living in the old Hoban House as early as 1901 when his friend Cringle and his family visited him. Cringle was a deputy tax commissioner in New York City. His son Edward J. Cringle would go on to become a doctor and serve in the army medical corps during World War I. Edward Cringle, the father, died in 1907. His widow and son continued to split their time between Manhattan and Huntington. 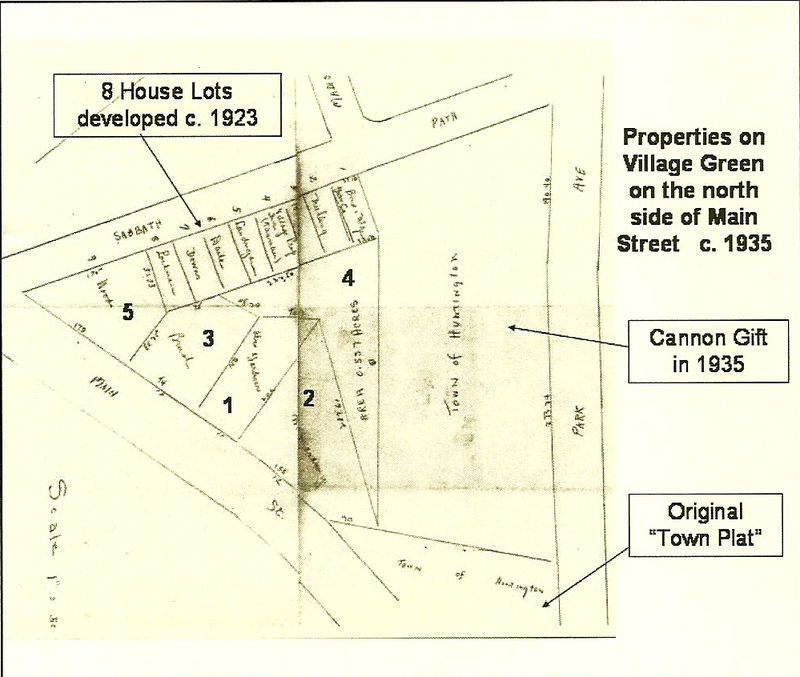 In 1914, Sarah Cringle had the property subdivided into 25 building lots. She also tore down the old farmhouse and had “an attractive new home” built. 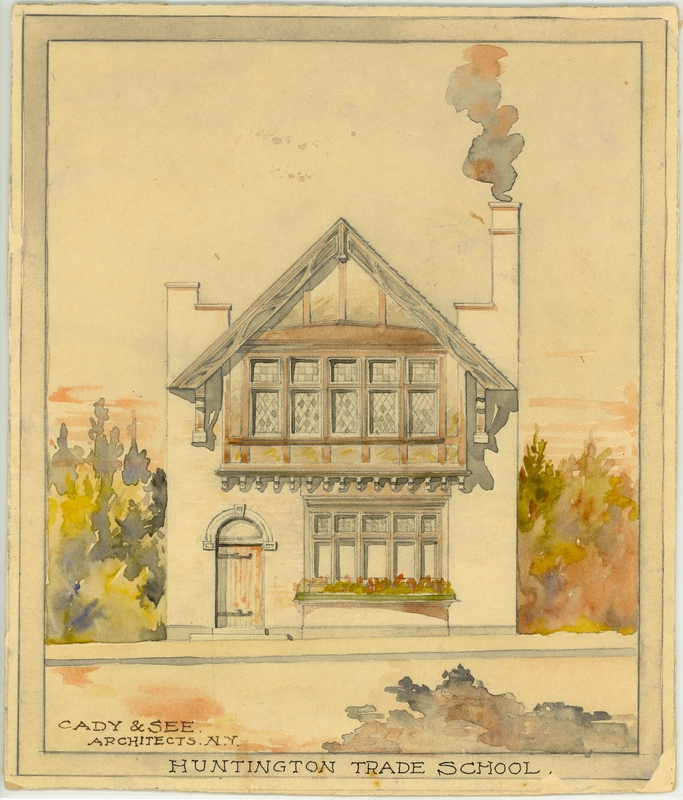 Mrs. Cringle sold that house to lawyer—later judge—Isaac R. Swezey in 1918. Thus began a quest to preserve open space in the heart of Huntington village. Fifteen years earlier, August Heckscher donated his namesake park to the children of Huntington. Mrs. Cannon’s donation of what came to be known as the North Meadow was a bridge between the old Town Common and Mr. Heckscher’s park. In 1935, the Town expressed interest in acquiring land along East Main Street. The Main Street frontage had been divided into four different lots, one of which contained the house Mrs. Cringle had built in 1914. A fifth lot was located between these lots and the North Meadow. The remaining pieces of the Hoban Farm had been divided into eight small lots on Sabbath Day Path, each with a house. Following Mrs. Cannon’s lead, the members of the Committee on the Preservation of Old Huntington—by now known as Old Huntington Green Association—set out to secure the other plots. They worked in secret for fear that property owners would inflate their asking prices if they knew a group of wealthy residents was interested in buying their land. In 1938, Clarence Brush, a partner in a local real estate and insurance agency and acting as a straw man, acquired the second lot in from Sabbath Day Path from Frank Patterson. Ten days later he conveyed it to Old Huntington Green Association. Two years later Brush acquired from Alice Gardiner the lot with the house Mrs. Cringle had built. Marshall Field provided the $4,500 purchase price. Six days later Brush conveyed the house lot to Old Huntington Green. The house was rented to the Reverend Humeston, who had just retired from the pulpit of Old First Church. The back lot was acquired by the Association from William Jenkins in 1941 after the owner failed to pay the property taxes. The final piece was acquired by Mrs. Ingersoll in 1952. She conveyed it to the Association in 1954. These four lots were consolidated and the 1.62-acre parcel was deeded to the Town of Huntington in 1957. Although the Association had been incorporated in 1939, its existence remained unpublicized until the 1950s. The first newspaper reference to the group was in 1953 and the gift in 1957 was its first public announcement of its work. Eight years later, the Association built a memorial fountain with the mill stones from Huntington’s first mill. The fountain was designed by Mrs. Baker and dedicated to the memory of Raymond Ingersoll. The fountain sits on the property the Association had deeded to the town in 1957. Now the only property in the triangle not in public hands were the eight houses on Sabbath Day Path and the lot at the corner of Main Street and Sabbath Day Path. The owner of that last lot, Dr. Frank C. Ciafone, announced plans to erect an office building on the property. A year after the gift from Old Huntington Green, the Town Board, at the prodding of the Association, voted to acquire the property from Dr. Ciafone for $20,500. The Association now turned its attention to the eight houses Dr. Cringle had built on Sabbath Day Path. They were the only interruption on a wide swath of public open space extending from the Town Common through the North Meadow and across to Heckscher Park. The Association decided to buy and demolish these houses and turn the vacant land over to the Town. Their first purchase was of the fifth house from Main Street in 1955. 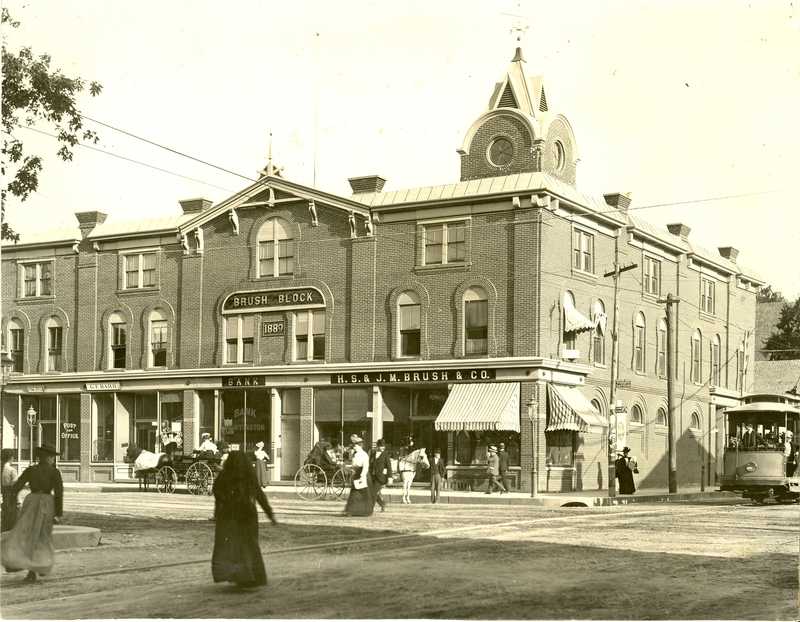 Ten years later, the Association acquired the first and third houses from Main Street. A fourth house was acquired in the 1970s. The Association has transferred ownership of two of its Sabbath Day Path houses to the Town of Huntington and they were demolished. The Town also acquired two other houses that have also been demolished. Today, four of the original eight houses remain: the Association owns and rents out two; and two others are privately owned. Old Huntington Green, Inc. was concerned with more than just preserving open space in the Village Green area. The group also wanted to preserve historic structures. First it had to determine which early buildings remained in the valley stretching from the Green to the harbor. After exhaustive research, 32 buildings were identified. In 1937, Lester B. Pope, supervisor of the Pratt Institute’s Architectural Department and district officer of the Interior Department’s Historic American Building Survey on Long Island, was asked his opinion of the historic value of Huntington’s old buildings. He replied that “Old Huntington offers, I believe, one of the most unique historic areas that we have—certainly on Long Island. It presents an old township which with ease could be restored to its original historic layout and atmosphere.” Today, of those 32 houses, all but six still stand. Of those that remain, all but four are now protected by local landmark designation. The Association’s plan called for preserving these historic structures and moving other historic buildings—such as the Historical Society’s Conklin House—to the Village Green area for protection from unsympathetic development. Pratt Institute was retained to prepare a map showing the 32 houses. A photograph album with descriptive captions of each building was assembled. Old Huntington Green, Inc. hired Armistead Fitzhugh Brinkerhoff, president of the American Society of Landscape Architects, to prepare a master plan for the entire valley. The Brinkerhoff plan was unveiled in November 1939. The group was impressed by the scope and beauty of the plan that would be a Long Island version of Colonial Williamsburg, which had been started just 13 years earlier. Then Marshall Field asked how much it would cost to implement. Brinkerhoff estimated the total project as envisioned in the plan would cost one million dollars—equivalent to about $16.7 million in 2013. After giving it a few days thought, Field said he might be able to take on a project with a budget of $50,000 to $75,000. The grand plan would have to wait. While the association continued through the war years, it was dormant from 1948 to 1951. When it resumed activity, it found a town undergoing explosive growth. New houses were springing up all over town—even along Park Avenue just south of the Village Green area. The Green itself was protected, of course. But surrounding properties were ripe for redevelopment. The old gas station at the southeast corner of East Main Street and Park Avenue was to be rebuilt. The Association prevailed upon Mobil Oil to build a “Colonial style” gas station—surely a style for which no historic precedent could be found. Likewise the newly established YMCA planned to build a multi-story flat roofed building right across Main Street from the association’s property. The association again convinced the property owner to construct a “colonial style” building instead (although it has been greatly altered by later additions). A gas station proposed for the northeast corner of East Main and Park Avenue was not built. Instead a saltbox house designed by Florence Baker’s husband, architect Norman Baker, was built and was used as a real estate office. A proposal by the American Legion to build a clubhouse on the North Meadow was defeated as were numerous other proposals for the property. One project the association had a direct hand in was at the northwest corner of Park Avenue and Parkview Terrace. Mrs. Cannon had purchased the old Platt House at that location and had given it to the association. The house was in a poor state and structurally suspect. It was decided that it would cost too much to restore it. Instead, the property was sold to the newly formed North Shore Medical Group, who agreed to build a “colonial style” medical office, which remains today. The money from the sale of this property helped to finance the acquisition of lots on the old Hoban Farm. Old Huntington Green has had an ongoing influence of developments in the Village Green area. Concerned residents and government officials have pursued plans that track the association’s Master Plan, even though they may not have been aware of the plan’s existence. The enduring goals set down by the association are slowly being realized. Many private homeowners in the Village Green area have restored their homes. The first was the Metcalf family, who in 1941 purchased the Jarvis-Fleet House, part of which is considered to be the oldest house in Huntington. They began restoration of the house in the 1940s and that work has been continued by their son, Rex Metcalf, who continues to live in the house. Likewise, other homes along Park Avenue have been restored by their owners. The Historical Society joined the effort when it purchased the house at 434 Park Avenue in 1967. Originally identified as the Powell-Jarvis House and thought to date from the seventeenth century, later research and examination has confirmed a construction date of 1795 for Dr. Daniel W. Kissam. 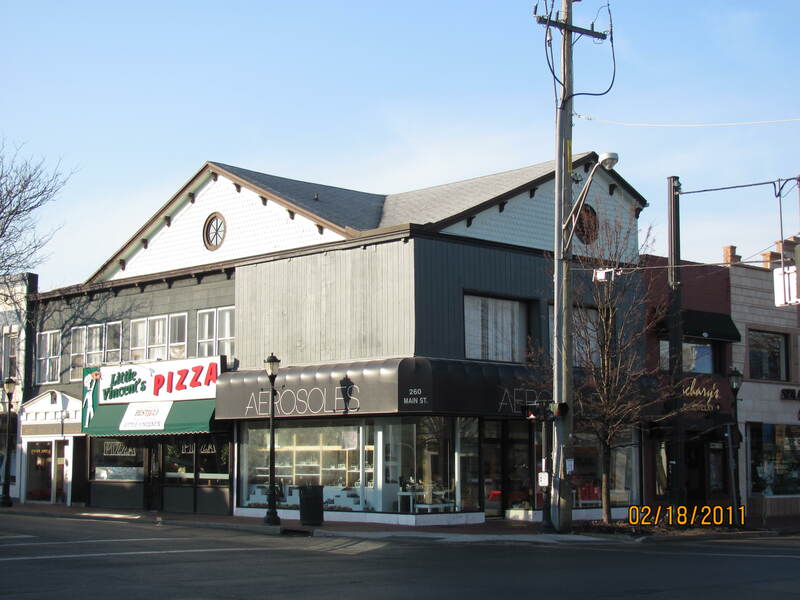 In 1980, the Huntington Town Board created the Old Huntington Green Historic District, which gives legal protection to the historic structures along Park Avenue from its intersection with New York Avenue to a point a few doors south of its intersection with Linda Place. A few years later a smaller historic district containing properties from View Acre Road to Sunny Pond Farm was listed on the National Register of Historic Places. The Association’s goals were unknowingly invoked almost 70 years after the group had been founded when another group of concerned residents rallied to prevent the development of eight acres of steeply sloped woodland just off Park Avenue about a half mile south of the Village Green. Explaining the residents’ concerns, Scott Johnson, then chairman of the Town’s Historic preservation Commission, said, “In the past, there have been those who want to preserve open space and those who want to preserve historical sites, and they’ve never really come together.” But, of course, they had seven decades earlier. In November 2001, the group nominated the property for acquisition under Huntington’s new Environmental Open Space and Park Fund program. The property was to be the beginning of a Heritage Trail that would snake through the open space left on the ridge above Park Avenue, continue to the Village Green and eventually on to the harbor. A year after the nomination, the Town and County purchased the land. Over the next few years, additional smaller parcels were added. The biggest obstacle to the completion of the Heritage Trail was the 7.2 acre Park Avenue Dairy site at the corner of Park Avenue and Woodhull Road. The property not only was mostly open fields and woods, it also contained a wealth of historic structures. First settled in the seventeenth century, the land had been used for some 266 years to graze cattle. It also was the site of a tannery; and during the American Revolution, Hessian troops camped there. The property includes houses from the seventeenth, eighteenth and twentieth centuries as well as a 1915 cement dairy barn and tile silo. The property was a dairy until 1958. But the property had been earmarked for other purposes. In the 1990s, a developer proposed building a 100 bed congregate care facility on the property. It was later acquired by a group looking to build a synagogue. When plans for the synagogue fell through, the owner filed a subdivision plan. Finally late in 2012, the developer agreed to sell five acres to the Town of Huntington. Two of the historic houses are to be sold to private owners. The third historic house—the1790 Chichester House—will be moved across Park Avenue to the Sunny Pond Farm property. Here, owner Tom Hogan will unknowingly implement another part of the Old Huntington green Association’s plan—preservation and repurposing of historic buildings. Mr. Hogan acquired Sunny Pond Farm after an unsuccessful effort by a different owner to build additional housing on the property. Mr. Hogan has restored the 1881 house on the property and has already moved the eighteenth century Ketcham house from Fort Salonga. The Chichester House will be joined with the Ketcham House and both will be converted into office space. The result will be an office campus comprised of historic houses in an open setting adjoining the Historical Society’s Kissam House property. Nothing better illustrates the Association’s vision for Huntington’s historic core. In the end, the fate of one property may well determine how enduring the Old Huntington Green’s goals are. The “colonial style” gas station on the southeast corner of East Main Street and Park Avenue has been closed for a number of years. The building has been adopted by a local artist who paints murals of historic scenes. He recently completed a mural commemorating George Washington’s visit to Huntington in 1790 when the president stopped for lunch at Platt’s Tavern, which once stood on this corner. The former gas station and the deli next door are inconsistent with the association’s vision. Over the years plans have been made to rebuild Platt’s Tavern on this site. There would be no time better than now when the gas station is idle. But who will take the lead to implement this vision? § Masses were held as early as 1840. The first St. Patrick’s Church was built in 1849, the same year Hoban acquired the house near the Town Common. If masses were held here in the 1840s, it would mean that Hoban had been renting the house prior to purchasing it. Huntington Highway Book A 1724-185, page 315 (May 6, 1848, recorded September 18, 1848. According to Romanah Sammis in Hunting-Babylon Town History, the right of way was first established in 1799 (page 51). She also reports that Hoban’s petition to discontinue the path in 1858, because it was “no longer necessary,” was granted. Suffolk County Clerks’ Office Deed Liber 572, page 413 and 414. The Long-Islander, October 30, 1958 and November 13, 1958 (Legal Notice). Unpublished manuscript history of Old Huntington Green, Inc. on file in the Huntington Town Historian’s office and at the Huntington Historical Society.